Saab plans a new 92 in the spirit of the 1950s model. 1. It won't be a retro design. 2. It won't be subjected to a design clinic. 3. It won't be called the 9-2X. Under General Motors Co.'s ownership, Saab rebadged a Subaru Impreza and named the car the Saab 9-2X. That car was sold in 2005 and 2006. "I deliberately call it the 92 [ninety-two] because I don't like the [name] 9-2. It reminds me of the Saab-aru," Victor Muller, CEO of Spyker Cars NV, said during a press event here. Spyker is Saab Automobile's Dutch owner. "The Saab-aru was the GM monster -- not because it was a bad car but because it was nothing," Muller said. "It wasn't an overpriced Impreza or underpriced Saab. It was neither here nor there. That is the type of badge engineering that you will never, ever see at Saab." Saab is in discussions with other automakers about co-developing the 92 and sharing a platform. No funds have been allocated for the project, but an announcement is expected within two months. Muller wants to restore buzz and sales to the Swedish brand, which struggled under GM and saw sales plummet to about 40,000 cars last year from about 130,000 five years ago. If built, the 92 would be aimed at a fast-growing segment for premium small cars. The segment includes BMW's Mini and the new Audi A1, which launches in Europe this summer. 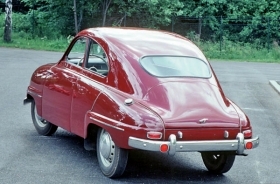 The 92 would have yearly production projected at 30,000 to 50,000 cars, Saab said. "This is a segment that is growing in importance and very important to the Saab brand," said Saab CEO Jan Ake Jonsson. Muller's concept for the vehicle would capture the teardrop shape of the 1950s car -- but that doesn't mean it's retro. "Retro is an expression of a lack of imagination, and definitely that is not where we are going," Muller said. And Saab would not be held to the desires of a design clinic. GM would create four design studies, narrow it to two and then "clinic it to death," Muller said. "I am capable of determining what is a proper design." Curt O'Donnell, general manager of Herb Chambers Saab of Boston, called the proposed 92 "a great idea." If the price is lower than the 9-3, Chambers said, "You will get entry-level customers who will step up and get exposure to Saab."